Fun Suitcases and Luggage Sets for Happy Travelers! The Most Fun Suitcases and Luggage Sets for Happy Travelers! Are you a cool and happy traveler? Do you absolutely HATE struggling at the baggage wheel trying to sort out your black suitcase from all the other black (and very boring!) luggage sets? Then you are going to LOVE these ultra-cool and ultra FUN suitcases on this page! They were made for YOU! Choose among the most colorful and unique suitcases around, that will be spotted at the baggage carousel in seconds! Are you almost ready to ‘pack’? *By the way, have you ever seen anything more FUN and HAPPY than this personalized monogrammed colorful suitcase for kids? Fun Personalized Suitcase for Kids! A gorgeous and fun personalized suitcase! Have fun on your fabulous trip! 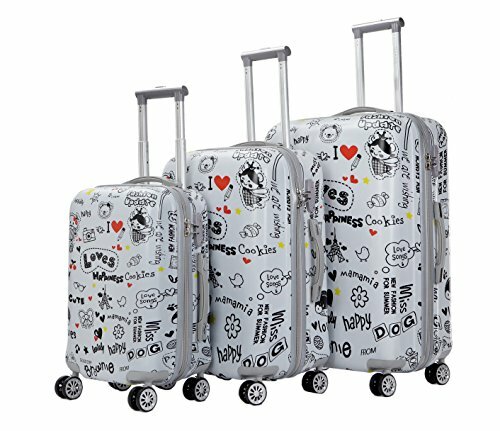 Very Cute Fun Creative Pattern 3 piece Luggage Set! I dare you to figure out all the cute sayings on these awesome, fun and ultra-cool 3-piece girly spinner set! Full of adorable graphics and inspiring fun words such as ‘happy’, ‘cute’, ‘happiness’, ‘cookies’ and more! Fun and Girly Luggage Set for Teen Girls! These are the cutest pink heart suitcases for teen girls traveling! Also perfect for girly sisters! The best news of all is that these are insanely cheap!! Fun RAINBOW Swirl Pattern Suitcase! What can be more fun and colorful than a rainbow? A rainbow suitcase!! It has a gorgeous rainbow swirl pattern! This is a fun and very creative neon rainbow swirl design suitcase perfect for girly teenage girls, colorful happy people or girly ladies! Fun Colorful Hearts Tree Design Suitcase! How cute is this perched owl pattern suitcase? Then carry a fun sunny forest print suitcase! We can almost smell the fresh forest air and feel the warm sun rays on our skin! 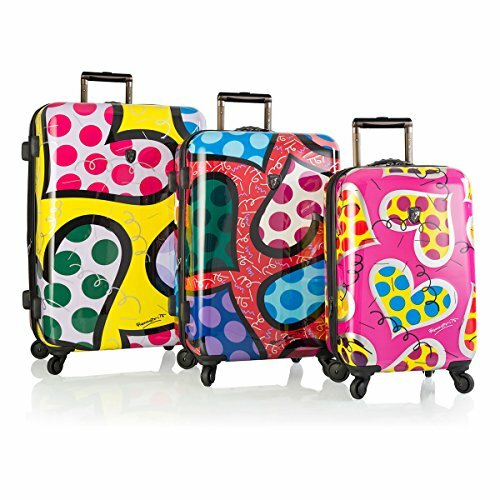 The Most Fun Heart Print Suitcases! 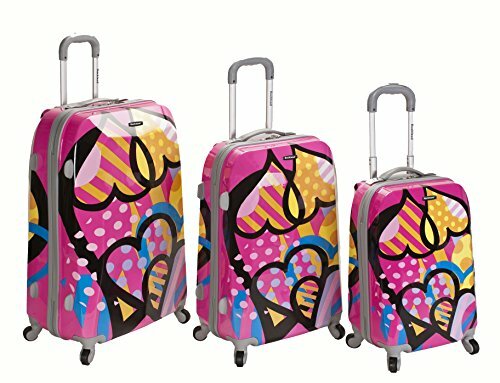 Then I bet you are going to love this fun and ultra-colorful HEARTS print luggage set! Cute Sun Face Drawing Blue and White Suitcase! Who wants to travel with the cutest and happiest SUN pattern suitcase on the planet? One of the most fun and creative suitcases design is this adorable blue-eyed yellow sun face drawing suitcase! The adorable sun is ready to travel with you! He loves traveling and taking his sunshine all over the world! *This cute suitcase is available in three sizes. You can also get one of each and create your own ‘sun face’ luggage set! Do you love a firefighter? Are you looking for a fun gift idea for him or her? Then I think you are going to like this cool (actually ‘hot’!) FIRE pattern suitcase! Cute Red Hearts Pattern Suitcase! How cute and girly is this?? Have you ever seen such an adorable red hearts pattern suitcase before? This is one of the most fun and adorable suitcases I have ever seen in my life! I BET everyone will be asking you where you got it! Don’t you want to collect them all?